Given the really warm and unseasonable February we have been having, we are inspired to think about spring. 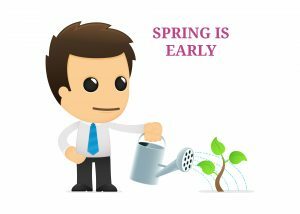 And with spring comes spring cleaning – seeing as we are recruiters, we are going to focus on your career. Here is a checklist with 8 actions to take for that professional boost. 1. Start a list of specific achievements and statistics, such as a time you increased sales by a set percentage with a certain campaign or innovation. 2. Think about the skills that were demonstrated when you achieved each and how it may benefit both your current and potential future employers. This is both a confidence boost that you are capable of making a real difference in your role and a chance to be prepared for your job hunt or promotion. They look fantastic on your CV and you can keep track of your future triumphs as well. 3. Notice the tasks that most stress you out in your day to day working life and the tasks you are most dreading. Think about how your attitude can be changed when approaching these tasks and seek advice or adjust deadlines if necessary. 4. Pick up on both the business value for these tasks and the opportunities that they may bring overcoming challenges and hurdles. Instead of feeling frustrated and overwhelmed, you know that this could soon become another achievement. 5. Look into opportunities to better yourself. These include training via courses, workshops classes and seminars, both on and offline. Mention it to your employer. 6. Arrange a career mentor who you can learn from and use for all sorts of advice. 7. Ensure that you take regular breaks at work using numerous tools and apps etc. Fitbits, for example, can be set to remind you to get up and take a short walk at regular intervals throughout the day when you are mostly sitting at your desk. 8. Disorder around your workspace can bring you down, so de-clutter and fill it with positive and pretty things to boost your mood. We hope this checklist will make you really think about your career and attitude as you tick items off. When you have emerged as the fresh and clean new you, we will happily help get you that dream job so give us a call!